Bottle koozies – what are your choices? It’s summer. You are out jogging in the park and by the time you finish, you are desperate for a cool drink of water. You take out the water bottle you had brought along and take a long refreshing swig. Only, the water has become heated and instead of appeasing your thirst, it just managed to make it worse. You are not the only person who faced this. Every day, thousands of people come across the same problem. So, consider this. 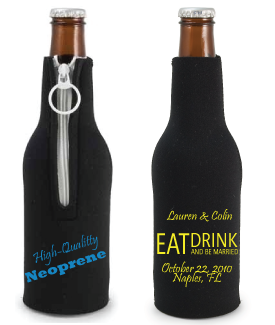 If you are thinking of the perfect gift to give to your clients or your business associates, how cool are bottle koozies? As you know from personal experience, everybody needs them and since they present a large surface area, they are ideal for getting your marketing message printed on it. When you are ordering bottle koozies as promotional gifts for your corporate clients and associates or for your loyal employees, always go for the custom koozies. Most online stores offer you the choice to customize your koozies. A number of standard templates are offered. For some extra money, you can even get your own message, slogan, logo or photo printed on the bottle koozies. The material is one of the first aspects that you will need to decide. Generally, you need to choose between two materials. One is the foam which is a good insulator. But the more expensive and at the same time, the more effective option is neoprene. It is the same material from which wet suits are made. So, they are excellent insulators which can keep your drink cooler for a longer time. Once the material has been decided, the next thing to choose is the style. The online store that you are ordering your koozies from, may offer only a few styles. If you want more variation, you should look over the internet first and once you like a design, you should contact that store and try to work out the rates. There are the collapsible bottle koozies which are very convenient and space saving. Some koozies are slip on and the size is of a standard bottle. Some koozies come with zippers for extra protection. Slip-on koozies generally do not have a bottom while zippered koozies have the bottom glued on. Special long neck koozies are also available for long necked bottles. For a bolder fashion statement, choose the funky sneaker shaped bottle koozies. The next thing to decide is the color scheme. The type and variety of color you decide to put on your koozy will affect the price. You can choose simple monochromatic bottle koozies, you can go for multicolored printed koozies or the koozies with the perfect camouflage design. The final step is choosing your message. If you are going to use the koozies as corporate gifts, a discrete name and logo of your company may be enough. However, if you are giving this as promotional gifts to prospective customers, you require something stronger. Fortunately, the surface area is large enough. In addition to your name and logo, you can print a short marketing message. Most companies allow you to print customized messages on your koozies. Once you have designed the perfect bottle koozies, order now in bulk. This will save you money as less will be charged per unit. You can give them to your existing as well as prospective customers, clients, business associates and employees. It is a practical gift which will be appreciated and your business will gain great exposure.